I admit it, last night at the Garden I forgot about Uno. 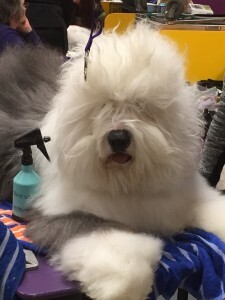 I had seen Swagger the night before at his first primping, I had seen him again before he hit the show floor and I was with the crowd cheering for that huge fluff of old English Sheepdog. 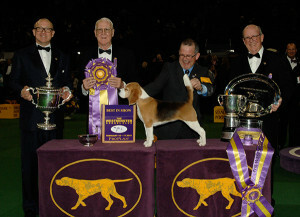 I didn’t even know at the time “Swagger” had finished second at Westminster in 2013. All I knew was I could not get enough of that snowy white and grey coat, that bounding gait and that face that filled the screen. 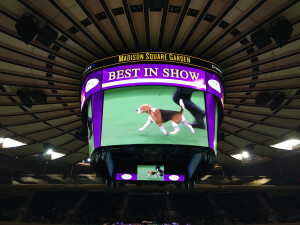 Then I saw his quote about Uno being the best loved Best in Show dog in 25 years. I had forgotten! Uno was an unbelievable gift. A charmer all around. Everyone loved Uno. What’s not to love about a beagle? And a charmer at that. Sure she’s a quiet one, but something tells me she will be loved just the same. I’m looking forward to seeing the divine Miss P. make the rounds. Sorry Uno, you’re not numero Uno any more. Make way for Miss P!